A couple of weeks ago on a Friday evening I was at Shaw Lido when I saw this DBS NFC one.tap booth outside and it was pretty amazing! I only knew about Visa Paywave (and only recently did I try it at Cold Storage, and that was cool as well) so when I heard that you can tap to pay with your phone I wanted to try it! What is NFC you ask? It means Near-Field Communications, which essentially is a short-range wireless communication technology that transmits data between a mobile device and a reader. Unfortunately my iPhone 5 has no NFC. Boohoo! I saw so many people win free movie tickets and moviebites combos. Even IMAX vouchers! There was also a guy who was wearing an NFC sticker on his shirt, so you just gotta find and tap him (with your phone!) to win. Hurhur. All you need is an NFC-enabled phone like the Samsung Galaxy or Sony Xperia. Basically most smartphones that run on Android or even Blackberry. NOT apple. Here's my colleague Mark who tried out the one.tap with his HTC phone! He won movie tickets! There are over 30,000 merchants in SG that accepts NFC payment, including Comfort/CityCabs (no more stretching across the seat to punch in numbers on the machine, just tap!). 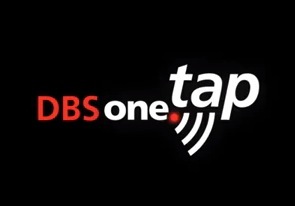 You can also tap at Watsons, Shaw Theatres (when you are late that is very important). There are also mobile coupons that you can redeem with one.tap. All of these tap transactions are possible because of collabs between DBS + MasterCard + Starhub + EZLink with the phone app "SmartWallet". SIGN UP for this amazing service on the DBS site now! There's a promo for free popcorn when you use One.Tap at Shaw Theatres to buy a pair of movie tix from now till end of the year. That's super awesome. GGGMTL!